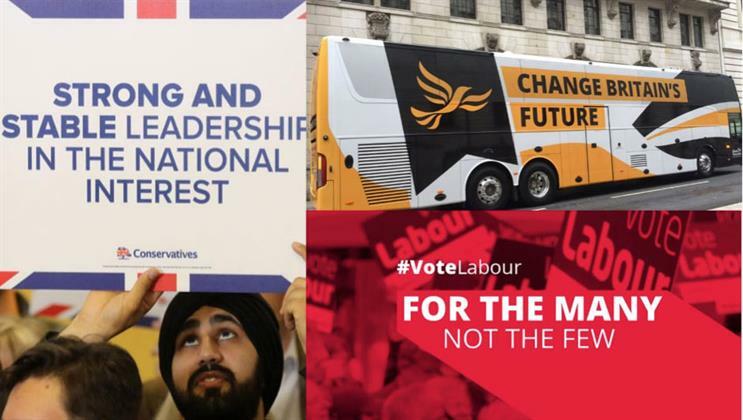 Now that the three main national parties have released their general election 2017 slogans, it is clear to Benedict Pringle, founder of politicaladvertising.co.uk, that only the Conservatives have adopted a strategy which seeks to win a majority of seats. The Lib Dems are simply trying to sweep up the most fervent Remainers and Labour are desperately trying to hold on to anyone who voted for them the last time round. As we enter week three of the general election campaign, the parties have had a chance to conduct some research and decide on their pitch to the electorate. Unsurprisingly, given the head start on planning they would have had, the Conservatives were first out of the blocks with their campaign slogan; by now you will have heard Theresa May promising "strong and stable leadership" at least once. The Lib Dems’ strapline was released towards the end of week two of the campaign and sees them offering voters the chance to "change Britain's future". On the weekend the Labour Party revealed that they have ditched "standing up for you" – the slogan which they launched their campaign with – and have instead opted for "for the many not the few". Given that each of these sets of words will have been poured over and analysed by campaign strategists, party leaders and focus groups, there is a lot that one can deduct from them. As the Liberal Democrats are the only national party offering serious resistance to Brexit, their ambitious-sounding promise to change the direction of the country is distinctly tenable. The same slogan in 2015 or 2010 would have seemed hollow coming from the Lib Dems. While it is both ambitious and tenable – both positive things in a slogan – it also reveals an acceptance that they will not be hoping to achieve a majority; the polls show that the majority of British people have accepted that Brexit is happening and believe that the government has a duty to follow the result. It will be interesting to see whether or not the Lib Dems can foster a big enough sense of "Bregret" in Remain voting constituencies to move the dial on their share of seats in the House of Commons. The Lib Dems positioning is a take on the classic challenger party strategy of "it’s time for a change". It is a sign of Labour’s tricky position that it feels unable to adopt a strapline which features an overt "change" theme – a rare event for a party seeking to replace an incumbent. The reason for this is that while nearly two thirds of Labour voters voted to Remain, the opposite is true when it comes to Labour-held constituencies, in which two thirds voted to Leave overall. This divide means that Labour has to avoid any positioning which could be interpreted as opposing Brexit. Labour’s slogan "for the many not the few" is a philosophical refrain that can be heard regularly at Labour Party meetings, is a partial quotation of Clause IV in Labour’s constitution (yes, the one Tony Blair controversially changed in 1995 and that Corbyn said he wanted to revise) and features on the back of Labour Party membership cards. While it’s a very appropriate organising thought for the Labour Party, given that it sounds like a piece of socialist rhetoric (because it is…) it’s unlikely to play well with the people who voted Conservative in 2015 who many view as essential to bring on board if Labour wants to achieve a majority. But the slogan will undoubtedly speak to people who are ideologically left-wing. The fact that Labour have adopted this slogan tells us that their strategy is to try and hold on to people who voted Labour in 2015 and increase turnout among their core supporters, such as students. Given that YouGov data from April of this year shows that only 52% of people who voted for Ed Miliband’s Labour in 2015 are planning to stick with the party this year, Labour’s attempt to sure up its base is sensible (and no mean feat), but clearly not a strategy for a majority. The Conservative Party’s slogan on the other hand is an attempt to speak to the whole nation. It promises continuity and permanence in a fast-changing and uncertain world: something which has mass appeal and speaks to a deep human desire for security. And Theresa May’s words are being backed up with action which demonstrates that they’re targeting every voter in an effort to achieve a landslide victory; last week she visited various areas of the country that have historically been deeply hostile towards the Tories, such as Leeds, a city with four Labour MPs who each won in 2015 by over 7,000 votes. Anyone betting on a tightening of the polls should be deeply dismayed by these slogans: they reveal very clearly that only the Conservative Party is even trying to win a majority. Coalition of chaos: Tory messaging or pollsters' plight?